A gala summer barbecue rib dinner with out of town visitors Eric and Cathy, and Bill and Beth, provided a chance to taste a selection of hearty big reds - California Zins, Aussie Shiraz, and a outlier Grenache. 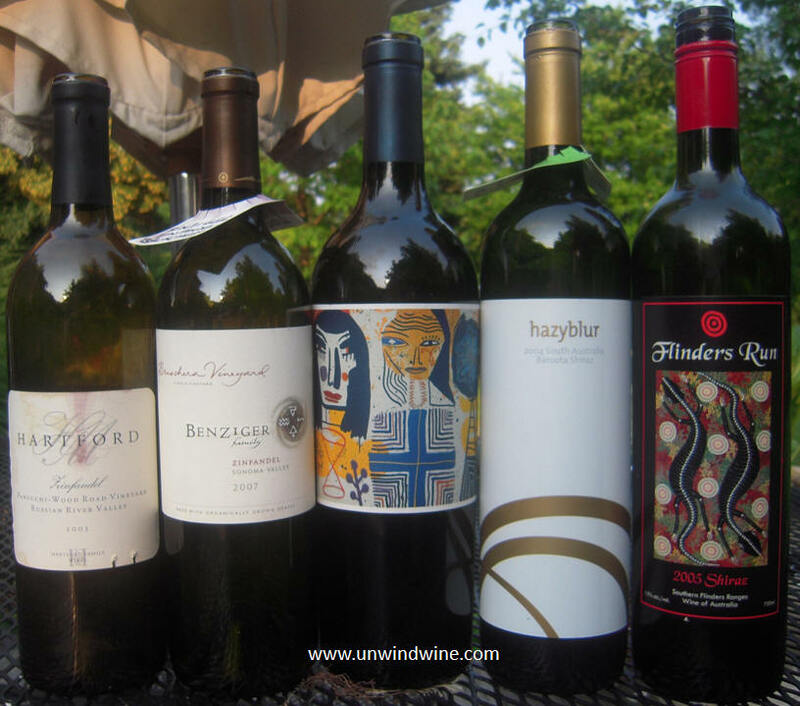 Following our Zinfandel barbecue a few weeks ago, we did a replay to try another pair of vintage Sonoma Valley/County Zins from Hartford Russian River Valley and Benziger Sonoma Valley. Bridging the Zins to a pair of Aussie Shiraz' was'Melée' Grenache from Tuck Beckstoffer, followed by HazyBlur Baroota and Flinders Ranges Shiraz'. These were all enjoyed with the ribs, artisan cheeses, bacon wrapped blue cheese stuffed figs and double chocolate cake desert. This single vineyard select offering sourced from century old vines is the fifth blockbuster Hartford Zinfandel I've sampled over the last decade and I have yet to be disappointed, or even to encounter a less than stellar offering. However, at $60 retail, this is at the high end for this varietal. Located in the Sonoma County town of Forestville, the winery is about 15 miles from the cool Pacific Coast, an area more noted for Chardonnay and Pinot Noir than Zinfandel, varietals also produced by Hartford. In the years near and leading up to this vintage the accolades were flowing for Hartford and their Zinfandel labels. The early release of Hartford Vineyard Zinfandel was chosen by The Wine Spectator's James Laube as one of the "Best Zins available in 1996". In 2002, winemaker Mike Sullivan named "Winemaker of the Year" by Ronn Wiegand M.S., M.W. in Restaurant Wines and Robert Parker's Wine Advocate named the Hartford Family Winery Winemaker, a "wine personality of the year." 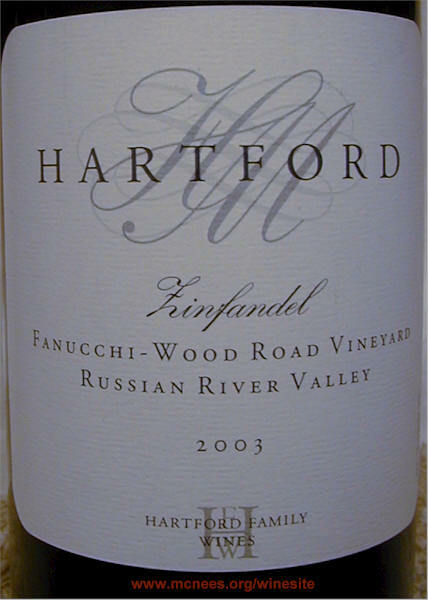 The 2000 Hartford Fanucchi-Wood Road Vineyard Zinfandel was named in the Top Ten Wines of 2002 by Bob Johnson, Wine Times, in January 2003. 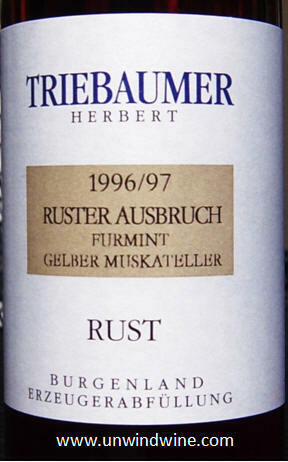 This vintage release at ten years old was still at or near its peak, despite some hint of age in its color. Dark inky garnet color with a slight brownish hue, this is concentrated and rich, with full aromas and dense flavors of black raspberry and boysenberry with hints of blueberry fruit intermixed with black pepper, spice and hints of wood and mocha on a firm tannin finish. Bill and Beth brought this hearty zin on cue for our barbecue. We became acquainted with Benziger Family Sonoma Valley wines when we met Erinn Benziger of Benziger Family Winery when she visited Chicago and presented at Binny's Beverage Depot Midwest Wine Expo. We all then visited Benziger Family Estate Vineyards and Winery in Sonoma Valley in the Autumn of 2009 during our Sonoma Wine Experience. Today over a dozen different family members are active in the extended family wine business that prides itself on the extent of its 'green' initiatives - certified sustainable, organic or Biodynamic© wines. A visit to their Sonoma Family Estate is a study in the practice with their numerous exhibits and self guided and formal tours of the property. blends which were the highlight of their Binny's Expo tasting, along with the Sauvignon Blanc. This Zinfandel is a limited single vineyard designated release from the Bruschera Family Vineyard, located on the Mayacamas (eastern) side of Sonoma Valley with twenty–two year old vines planted in white volcanic alluvial soil that produces hearty Zinfandel fruit with lush ripe flavors. As is the Benziger practice, the the Bruschera family practice organic sustainable agriculture - no herbicides or pesticides are used. The vineyard soil is nurtured through the use of cover crops, composts, compost teas and mulches. 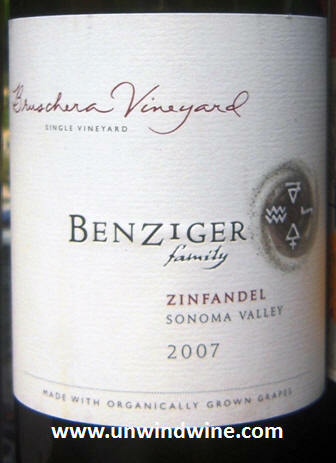 Benziger attributes the Bruschera Vineyard old Zinfandel vines to produce concentrated fruit with aromas and flavors of blackberry, bramble, black cherry and hints of oak, spice and espresso bean. Bill C's tasting note on Cellartracker - Deep indigo color. Soft, round but evidencing the bramble and spice expected in a Zinfandel. While certainly representative of the varietal, there are better, more distinctive Zin's available at this $35 price point. Bill C 84 points. RM 87 points. As reported in tasting blog last winter ... Wine enthusiasts will recognize the Beckstoffer name for their ownership of the legendary and exclusive To Kalon vineyard in southern Napa Valley - source of grapes to some of the most notable wines and labels from the region. Second generation Tuck Beckstoffer has created several brands and labels sourcing fruit from various sources throughout California. This is the second release of Melée Grenache. The large heavy oversize bottle is the first indication this wine is not for the feint of heart. The artistic primevil label should be further indication this is a unique wine. I would like to think that the over-the-top packaging is not to make up for the deficiencies in the product, but rather make a statement about the product the producer is striving to make, and that this particular product is not my 'cup of tea' as they say. More to the point, this is not the style of wine that I prefer and tend to favor but it was fun discovering and tasting. Grenache is a variety of grape generally grown in hotter climates such as Spain (Garnachia), Australia, the Southern Central Valley in California and in the Southern Rhone River valley in France. Grenache produces spicy, berry-flavored fruit that tends to be soft on the palate with a with a relatively high alcohol content. It is commonly used in blending Chateauneuf-du-Pape wines in the Rhone region, and in Australia with other Rhone varietals Syrah and Mouvedre to produce 'GSM' (Grenache, Syrah, Mouvedre) wines.I've never been a fan of Grenache however its generally not found standalone, but rather its generally widely produced to be blended with other varietals of complementary characteristics where the sum of the parts is greater than the parts resulting in a more complex but approachable and enjoyable drinking blend. The fruit for Melee is sourced from Central California. It is a deep ruby/plum color with characteristic Grenache aromas and flavors - cherry, black cherry, early season plum, scents of shale, new leather and a hint of tobacco,big forward flavors of red currant, hints of pomegranate and licorice with firm, tannins and soaring acidity that produce a long lasting, focused finish. Bill and I discovered and first tasted the Baroota label from this producer while attending an industry conference and dining together at Emeril's at Universal Studios in Orlando. I had previously picked up and tasted other labels from this producer from Total Wine in Virginia. Bill's tasting notes from Cellartracker - Continues to get better and better. Opaque, dark purple in the glass. Over time, the astringency and spice so evident when young has morphed into deep, complex and layered notes of mocha, clove, blackberry and a bit of plum. Although delicious in its youth, this is for me, a much more interesting wine as a 9 year old. Still 2 bottles left. Bill C and RM 89 points. One of our favorite wines with a big QPR (Quality Price Ratio). 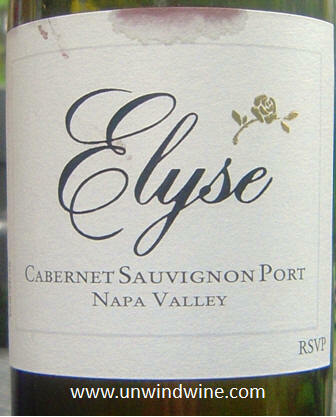 Dark inky colour - full bodied, elegant rich thick chewy - symphony of flavors of sweet currant, ripe plum, red raspberry, blueberry, a layer of mocha accented by hints of pepper, vanilla, and spice, and a lingering essence of creme brulee' and cedar on the long full soft finish. Now seven years old with a bit of age, this wine is smoother, more polished and more approachable than earlier tastings when young. We first discovered this wine down in central Illinois wineshop Friar Tuck's. We bought some and brought it home and loved it. We bought case quantities from Southern Hemisphere Wines in Huntington Beach, SoCal. Eventually Binny's featured this wine and we bought it all and are fortunate to have a supply as we continue to enjoy this wine which is improving with age! Ironically, I was downstate last week and ventured back into that Friar Tuck's store and they still had two bottles remaining from their original two cases. Needless to say, I grabbed em! Two bold and hearty Australian Shiraz's - perfect complement to hearty barbecue rib dinner with special friends. 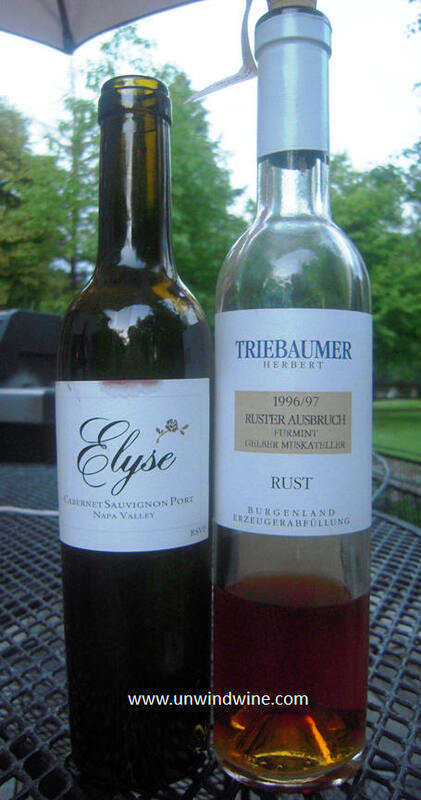 After dinner with double chocolate cake, fresh fruits and angel food cake with chocolate sauce we served two dessert wines - Elyse Napa Valley Cabernet Port and Triebaumer Ruster Ausbruch. The convergence of our two dinner guest couples, Eric & Cathy are in town to visit daughter Elyse, namesake of a Napa wine producer that we visited with Bill & Beth during our last Napa Valley Wine Experience. We picked this up at the winery in anticipation of such a gathering. This Port is made from Cabernet Sauvignon grapes from the 1½ acre vineyard at the winery on Hoffman Lane in right off Highway 29 in southern Napa Valley. During the natural fermentation of the Cabernet Sauvignon, the native yeast was allowed consume half of the initial grape sugar before the fermentation was arrested by adding aged Zinfandel and Viognier Brandy from Germain-Robin Alambic - noted Mendocino County brandy producer. The winemaker notes - This Port reveals aromas of saturated blueberries, raspberries, and mint that lead to flavors of dark chocolate, whiskey, and vanilla. The wine spent 18 months resting in neutral French oak barrels.This Port is the perfect accompaniment to chocolate desserts or pair with blue cheese and sliced pears.